After years of opposition to Donald Trump’s proposed Television City, six civic groups promoted an alternative development plan which was ultimately agreed to by the developer. Westpride, chaired by Mr. Robinson, the Municipal Arts Society, Natural Resources Defense Council, The Parks Council, Regional Plan Association and the Riverside Park Fund joined with the Trump Organization to form the Riverside South Planning Corporation (RSPC). and 300,000 square feet of ground floor retail space. The plan includes rigorous design controls and sustainable development standards. 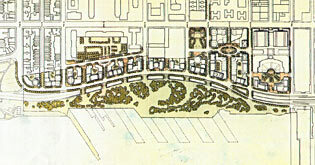 It also hosts a 21 acre park, New York’s largest planned public open space since the late 1800’s.